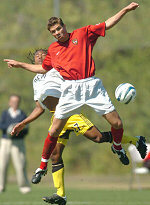 The MetroStars suffered their first loss of the 2005 preseason after falling to the Columbus Crew, 1-0. Crew midfielder Kyle Martino netted the game winner in the 30th minute on a chip shot over the head of Metros goalkeeper Zach Wells. Despite the loss, the Metros showed improvement from their first game and generated a great deal of pressure on the Crew defense, something they lacked against FC Dallas. In the first half, Mike Magee just missed netting a free kick from about 25 yards away. With a line of Crew defenders in front of him, Magee unleashed a brilliant bender that made its way around the wall but did not turn enough to find the goal, as it caught the right side of the net out of bounds. Magee set up two more scoring opportunities in the first 35 minutes, both on through balls from midfield. On the first, Crew goalkeeper Jon Busch won a footrace with Metros forward Eamon Zayed and stuffed Zayed before he could get a shot off. On the second, MetroStars midfielder Eddie Gaven couldn't quite get the Magee pass under control and fired wide of the net. During the second half, Crew goalie Matt Jordan made a number of tough saves to preserve the clean sheet. Metros forward Cherif Toure almost tied it up twice, including once in the final 30 seconds.